Thanks to the new KF series of binoculars from Fujifilm, you won’t have to. With stylish design, quality optics and a model to suit any budget, they’ve thought of everything. Whether you’re bird watching, scoping out your next wildlife photo, watching a sports event or spending the afternoon hiking, a pair of binoculars guarantees you won’t miss a thing. With the high-quality design of Fujifilm’s KF line up, and models to suit any budget and ambition level, you can get the best binoculars with no need to compromise. While the trendy styling of Fujifilm’s KF binoculars might be the first thing you notice, the next is likely to be their compact form. Thanks to their roof prism design, these are lightweight and compact. But it’s only when you pick them up and start using them that you’ll really appreciate the quality that goes with the KF series. Award-winning, multi-coated lenses and phase correction help to improve brightness, contrast and overall colour accuracy, while eliminating glare, reflections and chromatic aberrations. Even when light conditions might be challenging, you’ll still get realistic images. To guarantee a clear view every time, they’re filled with nitrogen gas to prevent internal fogging. And in case you have any differences between your eyes, there’s also a right-eye dioptre to fix that, too. A durable aluminium body and rubber armouring not only protects these binoculars from impacts and abrasions, it also means the KF series is fully waterproof. Thanks to robust, tight seals, they can withstand the most severe weather conditions, from rain and snow to sweltering temperatures. You’ll appreciate that rubber armouring in other ways, too. As well as giving the series its stylish, modern look, it means the binoculars feel good in the hand. The central focusing wheel feels smooth ­– it’s easy and quick to turn, but with enough tension that it doesn’t move once set. And because these boast a wider field of view than many competitors, it’s also easy to lock onto your subjects quickly – and stay with them. 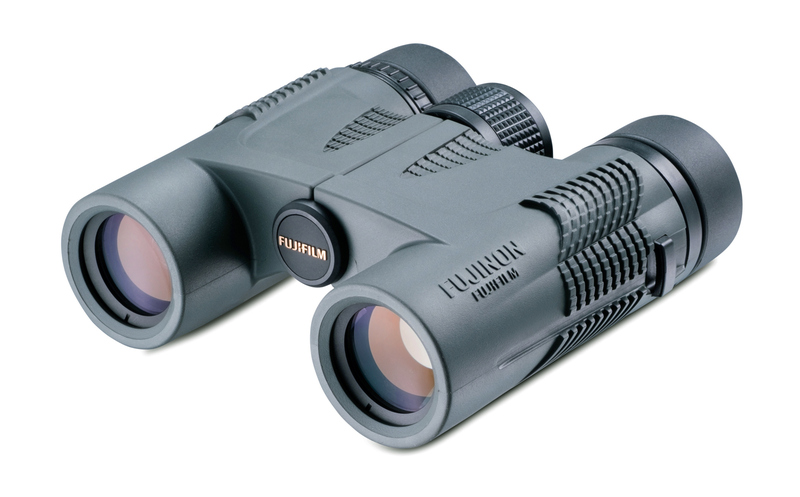 Fujifilm’s KF series boasts stylish design paired with high-quality coated glass and attention to every detail – if you’re in the market for a pair of powerful binoculars, you can’t go wrong here. The technology behind roof prism binoculars dates back to the 19th century. Roof prisms work by juggling light rays through a labyrinth of angles, achieving miracles of magnification within a compact housing. The mathematics behind it all were first formulated by Ernst Abbe, director of research for Carl Zeiss. He spent his time working out the mathematical laws governing the paths of light through microscopes. It is his pentaprism, known as the Abbe-Köning prism, that lies at the heart of many of the best binoculars on the market today. Exclusive to Jessops, the range has models to suit any budget. Take your pick from binoculars with 8-10x magnification and lens sizes of 24-44mm.